Getting traffic from search engines is extremely important. Whether you’re building a website for fun or for earning profits via Adsense, it will fail sooner or later if you do not optimize your SEO and website traffic. In this guide, I’ll show you exactly how to optimize your search engine ranking in 2019. I’ll show you what SEO is all about, explain how it works, why is it essential, and propose strategies on how you can effectively use it to skyrocket your site rankings on Google (and others). I’ve included everything which I believe is important in the world of SEO. I’m also including Youtube videos from many SEO experts that explain each concept in depth. So better grab a cup of coffee and some snacks since this article covers quite a lot of information on SEO, and is, therefore, a long read. Here’s the outline of the whole article so you can quickly jump to any section whenever you want. Let’s tackle everything about SEO in detail. First, let’s start by defining what it is. 3 3) What is Google RankBrain? 3.1 How does RankBrain work? 4.1 What Are Keywords and Why Are They Important? Every time you key in a word or a phrase on search engines like Google, Bing or Yahoo, a list of websites related to the topic will be given to you. On how does your web site appears on the first page of search engines is where the magic of SEO comes in. At its core, SEO is the process of increasing your website’s ranking on search engines. Its primary goal is to send more organic traffic to your website. It’s one of the most effective digital strategy being used today by businesses since it attracts potential customers on their website for free and increases chances for more conversions and eventually revenue. SEO works mainly on two things – visibility and rankings. It also focuses on delivering two main SEO objectives – organic traffic and conversions. To better understand SEO, let’s break down each term. Visibility: It describes how a domain will be prominent on search engines. The higher the visibility, the more prominent your domain is in Search Engine Result Pages (SERPs). Lower search visibility would mean the domain doesn’t appear on many relevant search queries. Rankings: It refers to the process of determining where to place a web page in SERPs. Organic Traffic: This term refers to visitors that land on your website as a result of “organic” or unpaid search results. Conversion: This term may refer to a visitor buying your product on your web site or subscribing to your channel. Conversion happens every time someone completes a desired action on your website. In today’s competitive market, SEO is an essential requirement. Millions of internet users look for quick solutions to their queries on search engines every day. It’s a great avenue to improve your business and attract interested customers. If you have an online store, blog or a website, SEO can help your website grow and achieve your business goals. These 5 reasons should offer some clarity as to why SEO is an excellent investment for your business. SEO helps provide web users with the fastest and most convenient experience on the internet possible. Search engines like Google have established themselves as an instant-answer-providing engine that offers users their sought-after information quickly and in fewer clicks. Therefore, a quality SEO would mean a positive user experience, while leveraging it to work on your business’ favor. Through SEO, you get to reach your targeted customers. With 3.5 billion searches on Google per day, there’s no debating that having a higher rank on Google’s search results would serve as a valuable opportunity to attract more traffic to your website. This is crucial since traffic would mean more leads, and eventually, generate more sales for your business. SEO can keep you ahead of your competitors. For instance, if two websites are marketing the same product, the search engine optimized webpage is more likely to attract more customers and make more sales than the one who doesn’t utilize SEO strategies. Every internet user begins their research for information on a search engine. More than 30% of them click on the first item on the search results while less than 10% make it to the second page. Having a higher rank means that Google and other search engines have found your website to be relevant. This enhances your business credibility and trustworthiness. It gives consumers a good feeling towards your business whenever they scan your site. SEO is the most cost-effective digital marketing strategy. Sure, it costs money, but it is relatively cheap in the grand scheme of things. The benefits will most likely be more significant in terms of brand exposure. SEO isn’t a marketing cost, but it is a real business investment. It will help your business afloat in the long run if implemented well. 3) What is Google RankBrain? If you’re now convinced how vital SEO is to a business, perhaps you’re now considering it. But before you even start on SEO, you have to know first how to optimize for RankBrain. Since Google is the leading search engine used by nearly 68% of internet users worldwide, I will speak about Google most of the time in this article. Everything you do for Google will also work the same way for Yahoo, Bing, Baidu, Naver, and every other search engine. In 2015, Google announced that RankBrain is its third most important factor when it comes to SEO. RankBrain is a machine learning algorithm launched by Google to sort the search results on SERPs. It also aids Google to process and understand search questions. In the past years, Google search results were hand-coded by engineers based on metrics they thought were working effectively. Today, human engineers still continue to work on the algorithm, but RankBrain is also working in the background tweaking Google search results autonomously. Depending on the search keyword, RankBrain can increase or decrease the importance of content length, content originality, domain authority, backlinks, reviews, etc. on SERPs. Then, it looks at how Google users find the new search results. If the web users are satisfied with the new algorithm, it stays. If not, RankBrain sticks to the old algorithm. For instance, if you type in “red velvet cake” on Google, RankBrain may decide that reviews are more relevant than backlinks so it can change the importance that those metrics carry on the SERPs. RankBrain follows this process until it arrives at the highest user satisfaction. A study has shown that RankBrain outperformed Google’s own engineers by 10% in identifying the best page for a given keyword, proving that RankBrain really works and is here to stay. RankBrain continually modifies the SERPs to find the most accurate search results and ranking for a particular keyword. RankBrain does this by using semantic analysis, which means it no longer base it on the keywords only, but it tries to figure out what you actually mean. It focuses more on the context and meaning behind your search. For example, RankBrain may have noticed that people who searched for “new console developed by Nintendo” are looking for results about video gaming consoles. So the next time someone searches for the same keyword, RankBrain offers the same results it already knowns. Every time you search a keyword, Google shows you a set of search results that they think will satisfy you. If a lot of people prefers one particular page in the search results, then RankBrain will give that page a ranking boost. Meanwhile, if a specific page doesn’t satisfy what the users are looking for a particular keyword, Google drops the page and replace it with another one. Now, that you have a clear picture of how Google ranks your pages through RankBrain, it’s time to dive into the importance of keyword selection. Recall that “keyword relevancy” is the first criteria that Google looks into in ranking pages. That being said, you may need to work on your keyword research to increase your web page traffic and rankings. To better understand how it will work, let’s first define what keywords are. Basically, keywords are the words and phrases that people type on search engines. It also refers to the topics you write about on your website. These keywords act like a bridge that connects the gap between your content and your target audience. Keyword research, on the other hand, refers to the method of finding the words that people enter into search engines. You can then use these words on your web pages, marketing, and content creation. Keyword research is a vital element of SEO. Get it right, and you can optimize your reach. Once you know what your target audience is looking for, you can formulate a way on how you can improve your content to provide the answers they need. For example, if you search for “mobile phones” you’ll get thousands of results. While, if you type in “2019 Samsung mobile phones”, you’ll get cellphone models released this year. Basically, from a web user’s viewpoint, the more context you add on the search term, the better and more specific the results on SERPs will be. Another word you’ll often see is semantic keywords, which is related to latent semantic indexing (LSI). LSI helps search engines to provide relevant keywords. It also processes synonyms to deliver the most accurate search results. You can see how LSI works whenever you type a word or phrase into the Google search box, and a list of suggested autocomplete results appears below it. The list of keywords changes as you add words to provide context. Search engines look for the most relevant and in-depth content for every query. With how vast the internet is, it’s not easy for search engines like Google to determine what a web page content is all about. That is why, Google rewards websites that offer relevant LSI keywords with high ranking and more traffic. LSI-driven contents are more favored and ensure that it’s attracting the right audience. Web users also benefit from it because they can easily and quickly find the content that they’re looking for to answer their queries. LSIGraph/LSI Keyword Generator is a free tool created especially for identifying LSI keywords. Other free tools that generate potential LSI keywords are Ubersuggest and the Keyword Planner Tool via Google AdWords. The first step is easy: making a list of words relevant to your website. If you know your niche, you already have a good idea of the type of information your target audience looks for. If not, brainstorming would be a good starting point for a list. Think about what you’d search for if you were in the shoes of your target audience. Another way to find the right keywords is to look for terms that are already bringing people to your website. Google Planner is one of the highly recommended tools for keyword research. All you have to do is enter a keyword from the lists you made from Step 1, and Google planner will show you a list of related words that you can use for your website. Google Planner is a free keyword search tool. It lets you monitor local and global monthly search volume for keywords, the estimated cost-per-clicks, competition levels, etc. To get keyword ideas, you need to login to your Google AdWords account and go to Tools, and click on Keyword Planner. Choose any of the three options under Find New Keywords and Search Volume and you’re ready to go. Other than Google Planner, there are also many keyword research tools available out there that analyze different aspects of a website’s performance aside form keywords. Some of the commonly used are Ahrefs, AnswerThePublic, SEMrush, and SEO Book Keyword Suggestion Tool. What if you got strong and well-established competitors for your targeted market? This is a problem since it’s hard to compete against large websites with a large audience. How do you attract the same market to visit your website too? Fortunately, there’s a way, and that is learning from the competition. With the right tools and approach, you can quickly identify your competitor’s best keywords and beat them at their own game. You just need a proper analytics setup, an analysis tool, and a testing budget. The key to any keyword research strategy is excellent analytics. You need analytics to know which keywords produce the most successful conversions and sales. Data on every conversion actions – form submissions or online transactions – will tell you how a keyword is performing. Such conversion tracking can be easily monitored through Google AdWords. In some cases, you aren’t only interested in form submissions, but you also want to track how often people chat or call you, make an offline purchase, and so on. Monitoring these type of conversion actions can be a bit of a headache, but it is equally important as other online actions. It is crucial that you optimize all possible conversion actions if you want to beat your competitors. For instance, in a study involving Google AdWords advertisers who were tracking a couple number of their conversion actions, it was found out that they were missing out 33% percent of their conversions. That’s a significant margin of error! That being said, knowing your analytics is crucial to finding the best keywords that will produce the best results. Competitive research is the process of studying which works for your competitors and what doesn’t. Does their success come from testimonials and reviews on their page? Or from the keywords they’re using? Knowing these things can help you develop a strategy for your business to attract the same market your competitor is targeting. By using the right competitive analysis tool, you can have a peek on which keywords your competitors are bidding on. Websites like Ahrefs, SpyFu, or iSpionage will help you get a list of all the keywords your competitors are utilizing on their web site. From here on, all you have to do is identify which keywords would be of benefit to your business. If you want to use your competitor’s best keywords, you have to know which keywords are worth to use on your website and which ones you should ignore. It’s a risk you have to try since you can’t assume that the same elements that work for your competitor would also work well for your business. It’s going to take a bit of experimenting. With that in mind, I recommend that you invest at least 20% of your paid search budget into trying out new keywords or ads. Assuming that you have good analytics, you’ve identified your competitors’ keywords and have tried them using your testing budget, this should give you enough information to determine the best keywords profitable to your business. On-Page SEO: It refers to the modifications you make directly to a web page to facilitate higher ranking. It includes optimizing content quality, structure and HTML code. Off-Page SEO: It describes all the SEO practices that are conducted outside of your website. It involves backlinks, social signals, link relevancy, and more. Both types of SEO play their own unique roles in improving your website ranking on SERPs. As we mentioned earlier, search engines take into account users satisfaction, thus the quality of your content is essential to your page ranking. We already learned how to choose the right keywords in the previous section of this article, so make sure that you create quality content that contains the keywords relevant to your target audience. This will lead to more people visiting your page and increases the chances of conversion. Your page’s content should be kept fresh and relevant not only to the keywords you’re targeting but to the current trends and season. Your web page should be up to date always. For instance, if your webpage still features the Holiday season when it’s the summer break already, you’re not helping your ranking. Make sure you update your website monthly or at least quarterly. In addition to the quality of your web page’s content, its performance is also a crucial on-page ranking factor. If your web page takes a long time to render correctly on either desktop or mobile devices, users will get frustrated and will exit your page without engaging. This activity will reflect on user satisfaction, and search engines will be able to detect this and therefore lower your page ranking. One of the most commonly neglected but is actually an essential on-page SEO factor is HTML tags. These tags aren’t directly visible on the web page, but they are detected, however, by search engines. It is crucial that you give importance to the structure of your page since it is one of the factors that search engines look into. Read on the next part to learn more about how you can optimize the structure of your page well. When creating new pages or improving your existing ones, consider the following on-page SEO techniques to help boost the SEO effectiveness of your website. It is crucial that you use SEO-Friendly URLs, which means URLs that include your desired keywords while demonstrating what the page is about. The key is to keep them simple and easy to read yet keyword rich. This is essential so that search engines can read your page easily and assign appropriate SEO value. The first one is an example of a website’s main URL, which will direct you to all your website’s posts for a given period. While the latter is an example of a permalink. It is important to make permalinks short, simple and SEO-friendly since both search engines and visitors make use of these URLs to index and visit your website. The type of permalink you choose will influence the way those two parties see and value your site. A URL with a load of incomprehensible texts at the end is less likely to be shared than a short and straightforward permalink. One of the most important on-page SEO factors is the title tag. Correctly used keywords on the title tag help to achieve a higher rank on search engines since Google’s algorithm weighs these tags heavily in identifying what your web page is about. I highly recommend incorporating keywords you are aiming to rank for on the titles of your posts. Make sure your title is still compelling and attracts the attention of visitors. Keep in mind the principles of writing quality headlines by writing title tags that are simple, straight to the point, and understandable. The H1 tags refer to the headline, and your article title should be wrapped around this tag. You can also incorporate keywords into sub-headings which are the H2, H3, H4 tags and so on but make sure not to over optimize your page. The purpose of the H tags is for Google to identify how the content is structured for readability. As you work on your page, take note of the headings and subheadings of your content and utilize similar principles that you used for title tags. Also, make sure that you are still following the flow of your material and that they are compelling and engaging to the viewers. The meta description is the short summary of a page content that you see on SERPs. It is a snippet of up to 150-160 characters, and it serves as a powerful tool since it is the only place on search engine where you get ad copy for free. Optimizing meta description is crucial for on-page SEO. Utilize those 150 characters effectively to make a call to action, promote your brand name, provide geographic locations and essential details about your business, and more. Including outbound links or links to other websites on your page also has a positive effect on SEO. Since you’re adding relevant sources on your page which your readers might also want to view, you’re helping to establish the credibility of your page. You are providing your audience with the references you used in writing your web post and allowing them to dig deeper on the content you posted. The length of a content piece is an essential factor in SEO. An industry study conducted by SerpIQ showed that a longer content tends to rank significantly higher on Google’s first page. However, your content doesn’t have to be wordy since average readers tend to scan your page first before they continue reading the whole material. Optimizing a web page is about getting the right balance between value offered and word count. So it is essential that your content’s word count is sufficiently enough to deliver quality information that meets the needs of your target audience. One way to get your readers to stay on your page for a longer time is to use images and videos on your posts. Use pictures and videos that are relevant to the topic and are visually appealing. When uploading images on your page, be sure to rename the file with descriptive name as it is essential for Image SEO. So instead of using the default name DCMIMG01.jpg provided by cameras, rename the file with what it is, for example, Nike-shoes-blue-2014.jpg. Moreover, optimize using ALT Text which is the text alternative to an image. Google uses ALT Text to read and learn about the image used on your page. Associating keywords on images is vital to achieving better ranking in the Google search image results. You can increase the traffic on your page by interacting with your audience. On your blog posts, encourage them to leave comments or questions if they have any concerning your posts. By responding to their queries, you are improving your relationship to your potential customers. It also adds to the credibility of your business. As previously mentioned, off-page SEO refers to creating an impact on SERPs rankings by making use of measures outside of your own website. It focuses on building high-quality links that direct to your website to help generate organic traffic and improve your ranking on search engines. The number of social media shares of a web page is a clear indication of valuable content. Search engines also consider this factor when identifying which pages to put at the top ranks on SERPs. Therefore, make sure you include social media share buttons on all your posts. Local SEO is an effective way to market your local business online. It helps companies promote their products to local customers when they look for the same category of products online. For instance, when you search for “cafes near me” on Google, it will give a list of coffee shops near your area. Search engines understand that you’re looking for suggestions based on locations, thus offering you local SERPs. By integrating local SEO with digital marketing campaign, businesses can boost their visibility online. Citations refer to inbound links that are directed to your website from online directories, such as CitySearch or Angie’s List. If you want to improve this off-page SEO factor, then you would want to submit your website information to as many high-quality directories as possible. Contrary to on-page SEO factors which you can modify, off-page SEO factors, on the other hand, includes things that you have no control over. An excellent example of this is your domain age. Generally, a domain that has been around for years looks better for Google and ranks them higher on SERPs. With this in mind, work on keeping your domain for a longer period as it would be more of value to you once it reached five or six years. Positive reviews from your old and new customers would play a significant role in building the credibility of your business. The more positive reviews and testimonials you have on your website, the more Google will pick up your ranking signal since it sees your business good enough to be recommended to other web users. A backlink, also known as an inbound link, is created when an external website is linked to yours. It is a crucial off-page SEO factor since Google considers the number of backlinks that a website has in identifying its authority and credibility. A website with good credibility could then lead to an improved ranking and visibility on SERPs. While quantity is crucial, the quality of backlinks is equally important too. Getting links from well-established sites and credible sources from your niche are preferable. Your target audience is more likely to visit your page when they are recommended by trusted websites. This method is the best and simplest way to get backlinks for your blog or website. If you write good articles with quality content, people will naturally link your site to their posts. Articles about tutorials or top-ten list about a particular category are good examples of posts that have high potentials for getting free and easy backlinks from other websites. Guest posting is the process of contributing free content to another website in exchange for a direct link back to your own page. It is a popular link building method since it benefits both parties: one earns a high-quality backlink, while the other gets free quality content to share to its audience. These backlinks can either be added in the author bio section or used to cite information within the body of the content. Technically, public relation is like a traditional marketing strategy, but in the context of link building, it refers to the practice of getting backlinks that you might use to get press exposure. One way to use this method is to be cited as a source in a press online content or news articles. In the past, the only way to achieve this is to hire someone with connections to journalists and prominent publications. Today, PR can be quickly done by signing up on Help A Reporter (HARO). This website provides journalists with a database of sources for their upcoming stories or press releases. After signing up, you can reach out to a journalist that you think is interested in your business and will cite you as a source. Another way to optimize this method is by publishing press releases whenever your business accomplishes something significant. Although this would mean hiring a journalist to cover you for your business event and perhaps also a paying a certain amount. In a similar way to writing good contents, starting a podcast is another way to make shareable content that will lead more backlinks to you. There are many podcast hosting sites at an affordable price for beginners, these include Buzzsprout and PodBean. Generally, such websites will automatically provide backlinks to your site on your podcast profile. You can also modify your podcast profile and include descriptions that promote your website. You probably heard about the terms like white hat SEO and black hat SEO. White hat SEO refers to strategies that help achieve top search results for a variety of keywords. They are termed white hat because they are safe to use and follows all the guidelines provided by Google and other search engines. Whereas, black hat SEO refers to risky tactics which when used will have higher chances for your website to get penalized. Smartphones and tablets are prevalent everywhere. The number of mobile searches is also continuously increasing over the years. Google states that there are 27.8 billion more queries performed on mobile phones than desktop. For that reason, it is crucial that you make your website resources accessible to mobile internet users. In the past, Google’s index would use a mixture of mobile and desktop results. Now, Google utilizes a Mobile-first Index which ranks search results based only on the mobile version of the page. So if someone searches an item on an iPhone, Google would show a list of mobile results only. When it comes to SEO, many people focus on ways to rank their page higher on SERPs. While it is indeed true that achieving a high rank is crucial in SEO. However, it will not help you to get organic traffic if nobody ends up clicking on your content. That is why understanding how to improve Click-Through-Rate (CTR) is essential to take advantage of earning organic traffic on your website. First thing first, you need to establish a baseline. You can check Search Analytics in Google Search Console (GSC) for the average CTR for your top ten keywords. Use these data to take targeted action and improve your organic CTR for keywords and pages that don’t measure up. Now that you know your baseline, your priority should be focused on saving pages that are in most danger of slipping from the SERPs. You have to turn these pages around to keep them and help in improving your rating. Search Analytics in GSC will show these pages that need to be modified or enhanced. One way to improve your low-performing pages is to compare them with your top-performing pages and analyze what methods you can apply to turn the losers into winners and eventually boost your overall website performance. GSC will also give you an overview of your website CTR performance by device – tablet, mobile, or desktop. You can use these data to determine what caused a particular page to perform poorly on desktop versus mobile. Also, take a look at how these pages appear in SERPs. There are times that title tags and meta description appear too long to show in portrait mode on mobile phones. Schema, which refers to Schema.org, is a semantic vocabulary of tags that you can incorporate on your HTML to improve the way search engines read and ranks your page in SERPs. You can check these things on GSC. It will provide you a quick way to confirm if your schema is working correctly or not. If you haven’t figured out yet the reason why your site is underperforming, take a look at your competitors and observe what they’re doing differently. Learn from the competition and apply methods to your website which you think you can adapt to improve your CTR. After trying all the possible measures to improve your CTR, check which method works best. At least every month, go back and check on your work whether there were improvements. If things went well, then replicate the changes you made across your other pages. Using Google Search Console (GSC) to check on your organic CTR performance should be a regular part of your routine in SEO. This is to let yourself get updated too with how your website is performing and make changes on things that need improvements. It’s a free cache plugin system that is simple and easy to configure. It enhances the speed of your web pages’ loading time, which is important to rank better in Google’s search results. Google Analytics is a handy tool, it provides you all the statistics you want to know about your website – how many views your pages are getting, what browser your visitors are using, which countries are they from, or what pages generate certain clicks. The Google Analytics by Yoast plugin is a WordPress plugin that will help get Google Analytics right into your website. Another WordPress plugin that will help the performance of your site dramatically is the EWW Image Optimizer. Every byte in your web page may cause your browser to load slower. Images generally take up the most space on a web page. The EWWW Image Optimizer reduces file sizes for images used in WordPress through either lossless or lossy compression. Lossless compression basically means your image size will be shrunk down without losing any quality of the original image. Lossy compression, on the other hand, permanently deletes original data. There are many SEO tools in the market which all works on helping you achieve the best SEO experience. You don’t need to try all those tools, but you just need to figure out which one works best for your website and business needs. Here are some of the most commonly used SEO tools today. Some of these were mentioned in the previous sections of this article, but let’s look into them in detail. Ahrefs is one of the highly recommended SEO tools online and is considered second to Google when it comes to being the largest website crawlers. This tool identifies which part of your website needs improvements to help ensure you rank well on search engines. When it comes to competitor analysis, Ahrefs would be handy in determining your competitor’s backlinks and use these data as a starting point on improving your brand. You can also utilize this SEO tool to find the most linked content within your niche. This a free tool that lets you monitor how your website appears in Google SERP. Google Search Console is an SEO checker tool that helps you understand how Google and its users see your website. The data it provides allows you to make modifications on your site and optimize for better performance in Google search results. SEMrush is a fan favorite SEO tool. It offers easy access to your rankings and allows you to evaluate your website performance. Doman Vs. Domain analysis is one of the most popular features of this SEO tool which lets you compare your website performance easily to your competitors. It is a Chrome extension plug-in that aggregates data from other SEO tools like Google Analytics, Google Trends, and Google Search Console to help you find the right keywords to rank higher in SERPs. What makes this tool great among others is that it combines the action of many free SEO tools to simplify the process rather than going through several websites each day. It is a vital tool to improve the overall performance of your website. It offers you the chance to collect data and analyze in-depth statistics about who your regular and new customers are, what they’re interested in, and how they interact with your online store. With Google Analytics, you’ll be able to validate any theories which you have about your website. AnswerThePublic.com is another free SEO tool that allows you to find good topics to write about your blog. This website gives you specific keywords within your niche that rank better online, and you can use these keywords as a startup to write a blog post. One of the best features of this tool is that it also presents to you a list of questions that web users often ask about a particular keyword. That is why, you can use this SEO tool to earn featured snippets, which are the short informational content that shows up in Google’s SERPs. Questions typed on Google trigger snippets at a much higher rate than other keywords. With this in mind, you need to identify which questions your target audience is asking, and how you can create content specifically focused on answering those questions accordingly. Read more about optimizing for voice search results. In 2016, Google launched Accelerated Mobile Pages (AMP) which is a very accessible framework to create fast-loading mobile web pages. It is an open-source initiative designed to allow publishers to enhance the loading speed of mobile web pages, improve web users’ experience for mobile readership and increase the overall performance of a website. You can easily implement AMP on your WordPress using a plugin like this one. According to Alexa traffic rankings, YouTube is the second most visited website on the web second to Google. Similar to your website, success on YouTube isn’t only about posting quality content, but it’s also about optimizing them. In YouTube SEO, optimization works can be encapsulated into a process that can be applied to all your videos, old and new. Here’s the entire Youtube SEO guide. 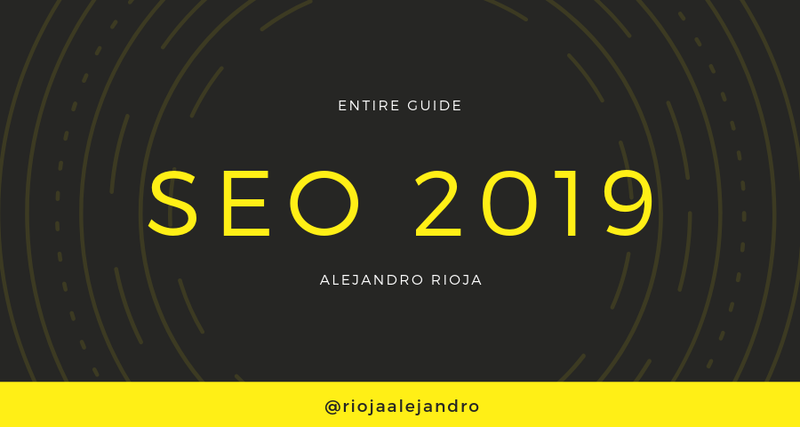 I hope you found this SEO in 2019 guide useful, and I most certainly hope you act on it today. I suggest you bookmark this tutorial so you can come back to it. I put a lot of work into this post, so if you could tweet it out or share it on Facebook that would make my day. If you found a new SEO technique that you didn’t know about, let me know in the comments!